Formerly featuring Candlemass riff-wizard Leif Edling in one of his many alter egos, Avatarium marries the doom mastermind's traditional take on the genre with a classic rock approach and a fantastic female vocalist in the form of Jennie-Ann Smith, making something in keeping with the recent occult rock craze but distinct enough to keep wary ears listening. 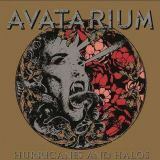 The band has had two other albums since 2013 to hone its craft, and although both 2013's Avatarium and 2015's The Girl With The Raven Mask have plenty to recommend them, Hurricanes and Halos is where Avatarium really step up their game. With classic doom and 70s throwback influences making their mark, and the songwriting being as good as it is, what you're presented with is eight varied anthems that are rooted in doom but which are individual enough to make for a more than entertaining listen. Whatever the future input from Edling, which seems to be lessening with each new album, it's hard not to see Hurricanes and Halos as something of an accomplishment for Avatarium, despite members having had experience with everyone from Tiamat to Evergrey; the songs being as individually as good as they are suggests that independence will be no problem. Everyone will have their own favourites, which is never a bad sign, but the Uriah Heep-esque keyboard-backed chug of The Sky At The Bottom Of The Sea is my pick for best track with its boogie-ing charm. It has stiff competition, of course; the Deep Purple-tinged balladry of When Breath Turns to Air is one pleasant rival, as is the epic opener Into the Fire/Into the Storm, which is probably the best track present at showing off Jennie-Ann Smith's vocals. The simply beautiful Road To Jerusalem's Eastern-tinged balladry isn't far behind, neither is the oddly psychedelic Medusa Child with its childlike backing vocals, seeming much shorter than its nine minute length. Meanwhile, when the band get into doom mode on A Kiss (From The End of The World) then the expected female-fronted-Candlemass itch gets scratched. By the time the three-minute title track comes around, the album is over, definitely leaving you wanting more; if this is Avatarium slipping away from doom in favour of a classic rock revivalism then fair enough. I didn't expect the band to be quite so throwback here, but there's no denying that they make it work for them, and while some will pine for a more original sound, the mix of influences here is good enough to recommend as is.